When it’s time to write a call to action, you may hit a writing roadblock. Your call to action (CTA) tells your reader what to do as a result of reading your post, letter, or email. You ask her for money or time or permission to invade her personal space and you may be stumped about what to say. Because for many of us, it’s hard to ask for something. Here’s a helpful writing tip to get you over that hump: use fewer words. Three or less should do it. You can expound on your CTA after you blurt out the actual words on paper or screen, if your project requires it. But first, tell her what to do. 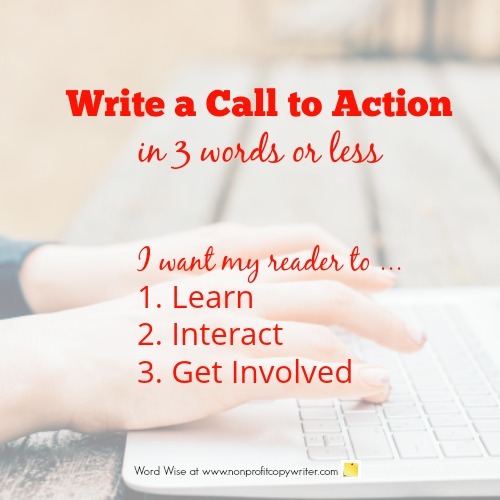 Your call to action moves the reader to do one of three things: learn, interact, or get involved. Your goal is to get the reader to take an action that increases her awareness about your cause: she clicks through to a webpage or downloads a free report. Your goal is to get the reader to take an action to interact with other readers or with you about your cause: click “Like,” comment on a blog, or send an email. Your goal is to get the reader to take an action that engages her more deeply with your cause: give a gift, make a purchase, or volunteer. Once you know what action you want your reader to take, use a quick phrase to get the point. Bonus tip: be sure to hyperlink your CTA to a page where your reader can complete the action. Just a few words – three or less – can prime the pump, giving you courage to keep writing.